FILE - Syed Salahuddin, Supreme commander of Hizbul Mujahideen whose militants are fighting in Indian Kashmir against the Indian army, addresses his supporters in Muzaffarabad capital of Pakistan's administered Kashmir, July 13, 2011. The head of a Pakistan-based militant group fighting Indian rule in Kashmir has warned that his followers will storm the cease-fire line that divides the region unless New Delhi ends its current wave of violence against Kashmiris. Syed Salahuddin, commander of the separatist Hizbul Mujahideen, or HuM, issued the warning Thursday while addressing an anti-India rally in Muzaffarabad, the capital of the Pakistan-ruled part of the disputed Himalayan region. He reiterated his call for Islamabad to cut all ties to New Delhi. “We will now have to announce and God willing practically cross the bloody line [the disputed Kashmir border] together with the entire population of Azaad Kashmir [Pakistani Kashmir] and mujahideen [holy warriors] as well as refugees [who have come from the Indian side] without fearing any restrictions,” Salauhddin said. He did not announce a date. Syed Salahuddin, supreme commander of Hizbul Mujahideen, Aug. 11, 2016. Tens of thousands of residents of Indian Kashmir have for weeks defied a strict curfew and security crackdown to attend street protests over the killing of a 22-year-old HuM commander, Burhan Wani, by Indian government forces on July 8. Since his death, clashes between stone-throwing Kashmiri youth and Indian security forces firing live ammunition, shotgun pellets and tear gas have left more than 55 civilians and two police officers dead. Thousands of civilians have been injured and hospitals in Kashmir are overwhelmed while scores are threatened with blindness by pellets lodged in their eyes; but, the violence continues to paralyze life in Kashmir. India regards Salahuddin, who also heads an alliance of 15 Kashmiri rebel groups called the United Jihad Council, or UJC, and his group as terrorists and blames Pakistan for fueling the recent unrest. Islamabad denies the charges and maintains it provides moral and political support to Kashmiris. It has condemned the killing of Wani as an "extrajudicial murder" and consistently denounced the use of force against protesters as a "blatant violation of basic human rights." Pakistan’s High Commissioner Abdul Basi in New Delhi was summoned to the Foreign Ministry on Tuesday amid allegations that Pakistanis have been trained and instructed to carry out attacks in India and Kashmir. Basi was also told that a Pakistani recently arrested in Kashmir confessed to Indian interrogators that he was trained by the Pakistan-based banned Lashkar-e-Taiba group before being sent to India for subversive activities. 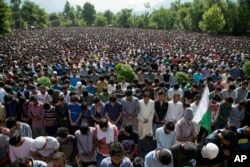 FILE - Kashmiri villagers pray during the funeral of Burhan Wani, chief of operations of Indian Kashmir's largest rebel group Hizbul Mujahideen, in Tral, 38 km south of Srinagar, Indian controlled Kashmir, July 9, 2016. Speaking at the weekly news conference in Islamabad Thursday, Foreign Ministry spokesman Nafees Zakaria responded to the summoning of the Pakistani envoy in India and the confession by an alleged Pakistani national. “We have rejected the [Indian] allegations or claim of any infiltration across LoC. We have a very firm policy in this regard that we would not allow our soil to be used for any terrorist activity against anyone,” Zakaria said. A military cease-fire line called the Line of Control, or LoC, divides Kashmir between India and Pakistan and both claim the region in its entirety. The dispute has sparked two of the three wars between the two countries and remains at the center of bilateral tensions. “A major cause of the uprising is the resentment among Kashmiri youths who have come of age under an Indian security apparatus that acts against civilians with impunity,” noted The New York Times in a July 21 editorial. “Kashmir is subject to India’s Armed Forces Special Powers Act, or Afspa, which grants the military wide powers to arrest, shoot to kill, occupy or destroy property. The result is a culture of brutal disdain for the local population,” it said. The newspaper emphasized the need for an independent investigation into the use of force by Indian security forces, saying that a failure to take such steps will only push more young Kashmiris into militancy, and make impossible a political solution that alone can end the “desperation” gripping the region.